The flag-draped casket of Sen. John McCain arrives inside the Rotunda of the U.S. Capitol on Friday. 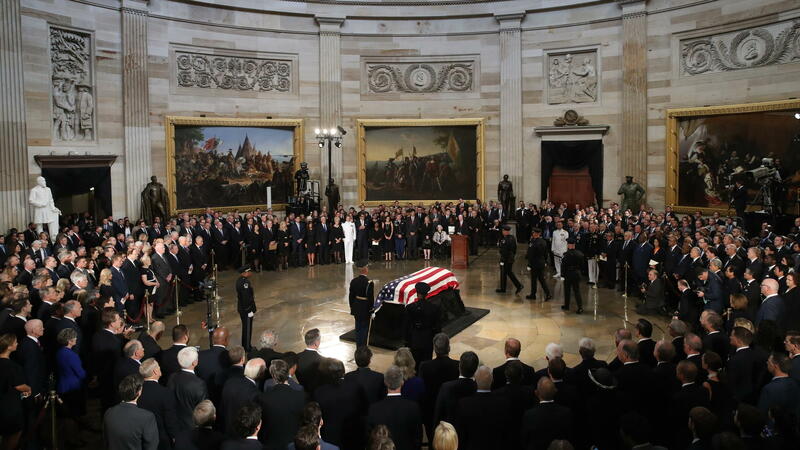 An honor guard carried his flag-draped casket up the Capitol steps in a sudden rainfall, and congressional leaders placed wreaths and delivered tributes to McCain, who served 35 years in the House and Senate. Senate Majority Leader Mitch McConnell, R-Ky., called McCain "a generational leader" in the Senate. The two often clashed on issues, most notably campaign finance reform. McConnell said McCain "would fight tooth and nail for his vision of the common good. Depending on the issue, you knew John would either be your staunchest ally or your most stubborn opponent." Vice President Pence said he was sent by President Trump to represent the administration "on behalf of a grateful nation." Pence said McCain's support "for limited government, for tax reform, and support for our armed forces surely made our nation more prosperous and more secure, and he will be missed." The Arizona Republican died Saturday at 81 and, after a funeral service in Phoenix on Thursday, his remains were transported to Washington, D.C. His coffin was placed in the center of the rotunda on the Lincoln catafalque, the wooden platform constructed for the 16th president's casket that has been used for all of the ceremonies in the rotunda since his memorial service. About 15,000 showed up to mourn McCain at a similar service at the Arizona state capitol Wednesday. Trump did not make the short trip down Pennsylvania Avenue to participate in the ceremony Trump's tense relationship with McCain continued even after the senator's death — it took several hours for Trump to issue a proclamation lowering flags at federal buildings to half-staff until McCain's interment. Mark Salter, a longtime friend of McCain's, told NPR's Rachel Martin on Morning Edition that McCain understood there was a shift in the nation's political atmosphere, particularly under Trump's presidency. "He spent much of the last year of his life trying to push back on that and explain this country isn't a country of land, blood and soil, but a nation founded on ideals, and those ideals have made us prosperous and powerful." House Speaker Paul Ryan, R-Wis., also spoke at the ceremony. Then Pence, McConnell, Senate Minority Leader Chuck Schumer, D-N.Y., House Minority Leader Nancy Pelosi, D-Calif., and Ryan presented wreaths to represent the administration, Senate and the House. The last person to lie in state in the U.S. Capitol was Hawaii Democratic Sen. Daniel Inouye, in December 2012. Inouye, like McCain, was a war hero, having served in World War II. He was also the second-longest-serving senator in history. Earlier this year, evangelist Billy Graham was "lain in honor" at the Capitol, a similar privilege allowed for citizens who are not military or government officials. On Saturday morning, a motorcade will bring McCain's casket to the Washington National Cathedral for a memorial service. On the way, his widow, Cindy, will stop at the Vietnam Veterans Memorial to present a wreath to remember all those who died in that war.